Work has been a bear lately. Creative juices pretty well dried up. So I did the M11 from Chris Roe a week ago and then again with the upgrade kit. Only, I enlarged by 20% to be RPG scale. Moving things around a bit in Gimp, after enlarging, I had a little extra room, so I added Luke, R2D2 and C3PO from mrentertainment, cardboard-warriors.proboards.com/thread/7068/star-wars-2d-figures, in the remaining space. Yeah, those engines are a bit tedious, but they look great. Hardly a good display, so I looked at the Xbox Kinect Mos Eisley, Ghost of Man Arid Village, and MomirFarooq's site. 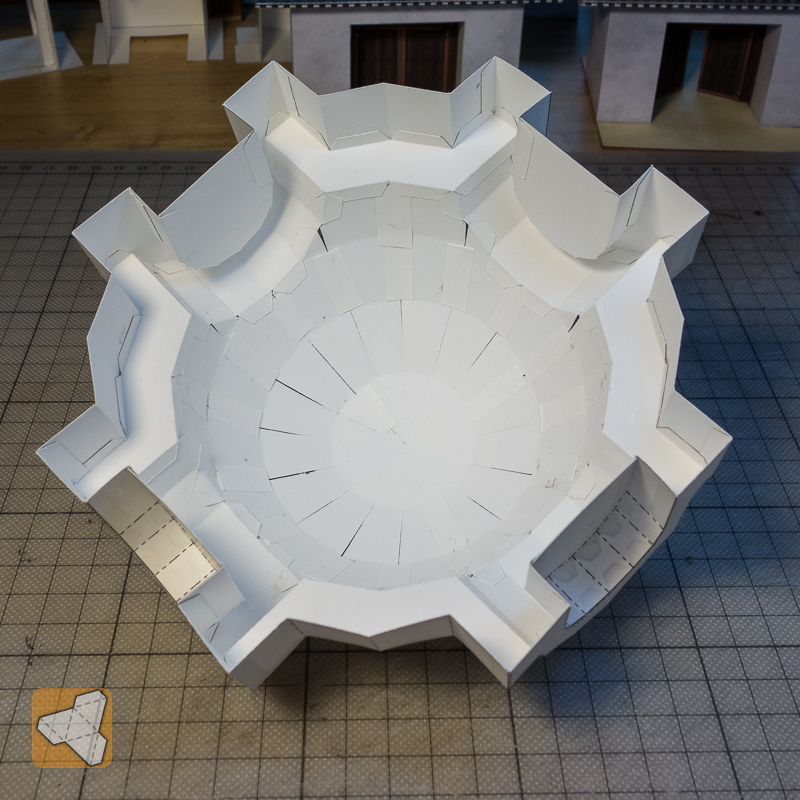 This gives me a head start on a diorama for Papercuts. The creative juices are at least oozing, if not flowing. 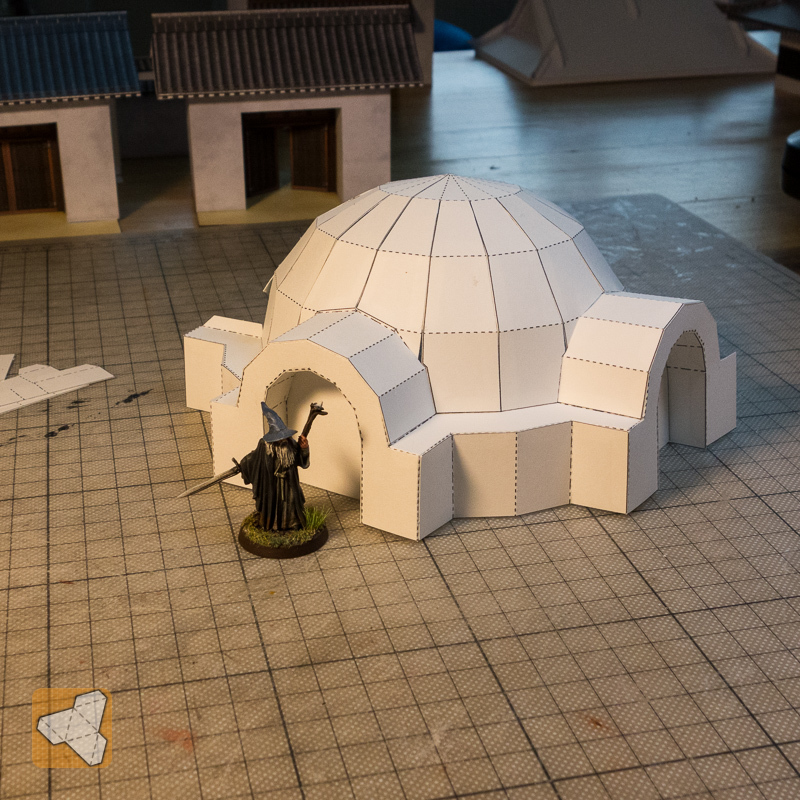 After I had printed the buildings and accessories, I realized how silly I was. I went back and converted to png files with transparent background, so I can do buildings without all that cutting and pasting. Then I grabbed the Sand Overlay from the One Monk Downloads, www.onemonk.com/bases.html, reduced and lightened the pattern to put in the tiles, and decided to do a road and plaza tile with the high traffic areas lighter still. I think this has started with a bang and is going to look great. I am headed to the cottage with my younger son for a week. I hope to make a start on my papercuts entry while I am there. 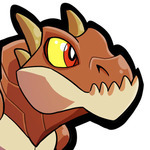 I've got a riding-lizard coming out soon, but it's probably a biiiit too far off model. How Lucas always has what appears to be populated fictional areas is one of those subtle things he does well. Mos Eisley has the appearance of being a functional desert town, including varmints. 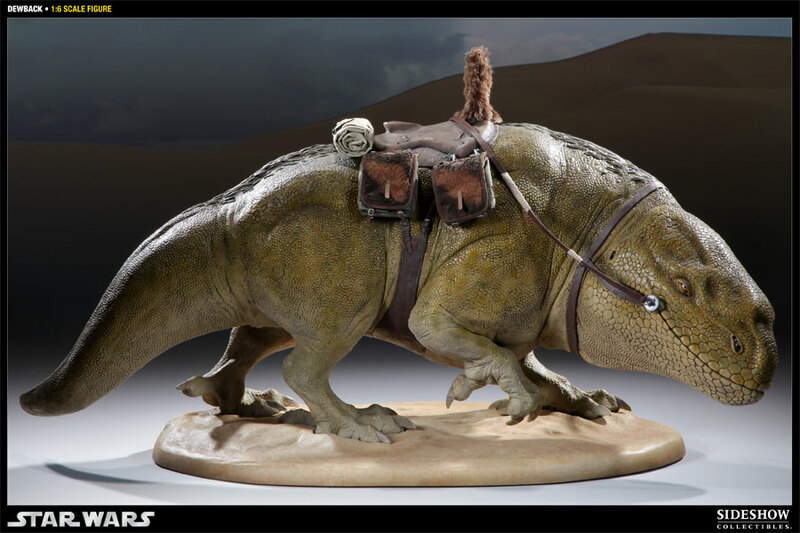 I might have to do the Bill the Bog Pony approach to a screenshot of a dewback. I'm sure it could serve as an excellent inspiration for a dewback fig. You didn't find any Jerba's, did you? I vaguely remember a middle eastern village set someone on the original forum here made years ago. The guy had a username with "vampire" in it I think. Anything like you had in mind? Edit: or do you mean the furry thing? The only pic I could find online was from Wookiepedia. Nice drawing, but I don't know who the artist is or how protective Wookiepedia is about their content. If you can use it, then I leave the fig formatting up to you. A little more messing around. 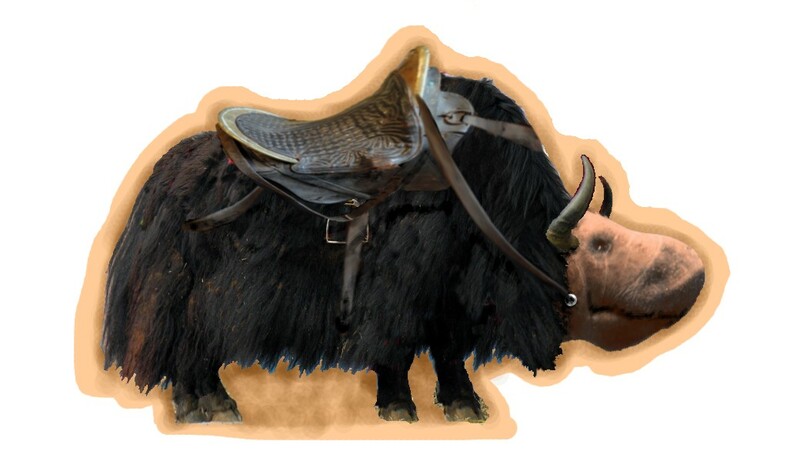 The saddle's kinda big...but who knows, maybe the rider is really big...? I didn't work on this last night. Did up a couple 'interesting' buildings. I will have to turn the horns into floppy ears, though and widen the feet, and give him bangs. I suppose I could list it as a group project on the Star Tales Hoard, if you wouldn't mind. I'm also looking at the mish-mash of other items that Lucas used to clutter up the place and make it look lived in. I imagine I'll have some vaporators and miscellaneous clutter that I can throw in the Hoard. 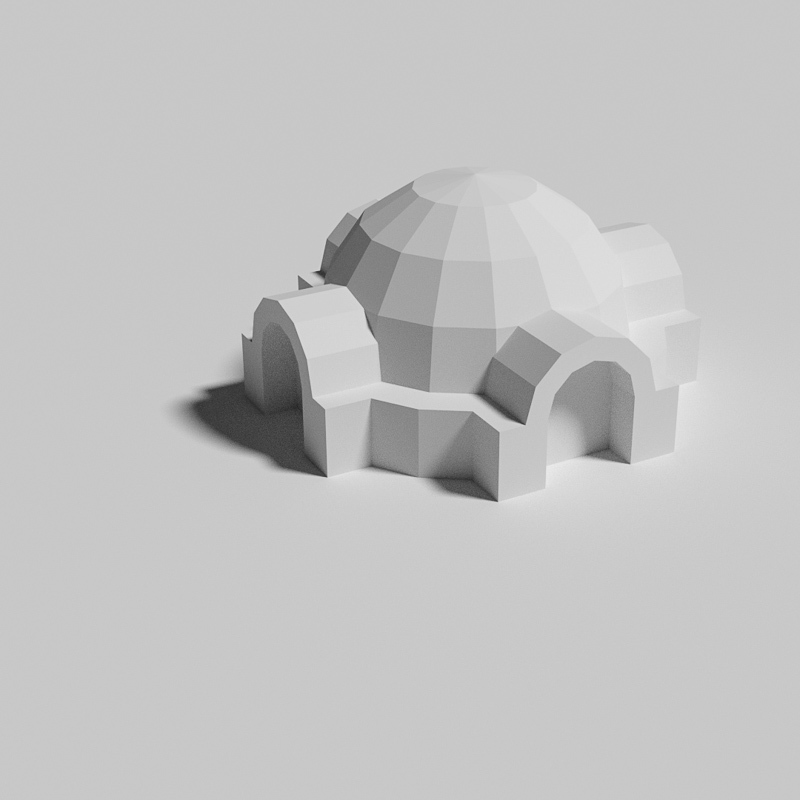 Are you interested in one of those domed Tatooine houses? I remember an "EasternVampyre" from somewhere. It's just a rendering but I will make an unfold ... prob by tomorrow. I won't really have a chance to do anything until this weekend, so no rush. I would think this could be a popular model, should you decide to release it. 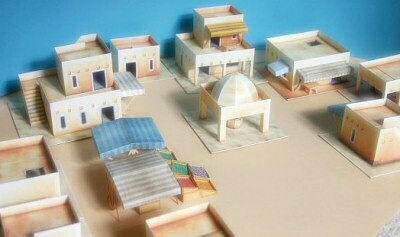 Can you ever really have enough Desert Village buildings? I had mentioned earlier the tiles. They should be lighter still, but will be fine for just a little diorama. These are Momir Farooq's tiles, erased and then overlayed with One Monk sand. Lightened and somewhat blurred. The cats messed with these for days before they started to separate much. I saw on OBS that someone was doing tile tuckboxes. It would make sense for me to start doing that. I also mentioned a couple interesting buildings. At this point, the Kinect buildings are going to be going away, replaced by better buildings, but I'm going to keep their windows, doors, art, vents and textures. Not true to the actual locale for filming, but they do seem to give the 'feel' of Mos Eisley. I've picked up enough screen shots at this point that I hope to have a building reminiscent of the cantina. Still working it out, but it seems very do-able. It's a very quick build as I am leaving for a meet but you get the picture. Very handsome building. I'm anxious to get to texturing it. Almost done. Texturing can commence very soon. I finished the test build. Founds some problems with the tabs which I'll optimize. Also I will make a little evolution so that you can take off the dome and have interior if required. I manually "underglued" (is that a word in English?) 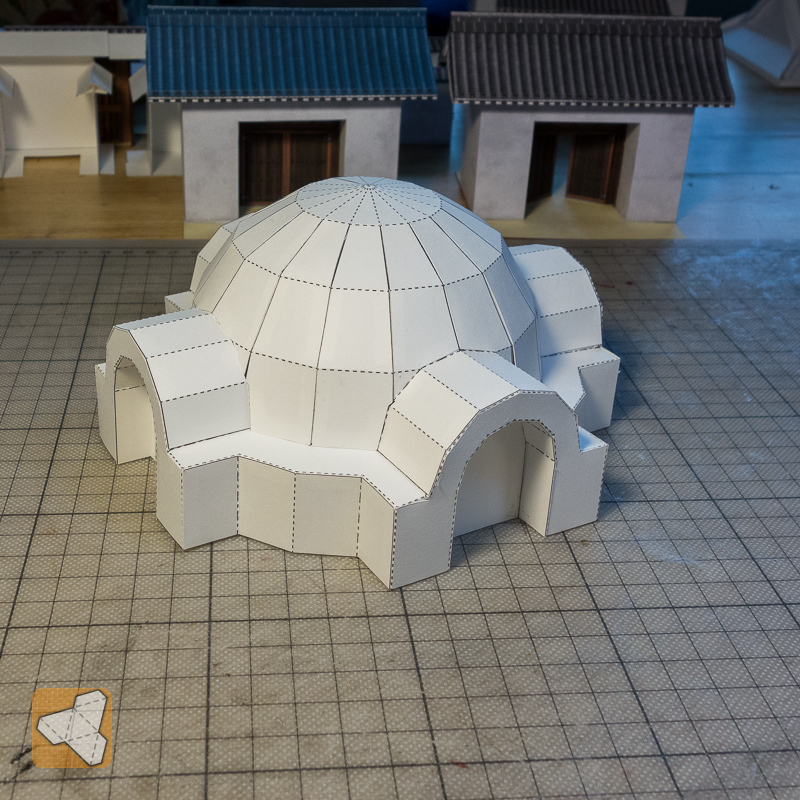 the dome parts so that the edges fit nice. But to make it easier I will make some better glue parts for the inside. So give me another day or two and then it's all yours Vermin King !